Good news for Verizon customers came in the form of a tweet from the carrier. 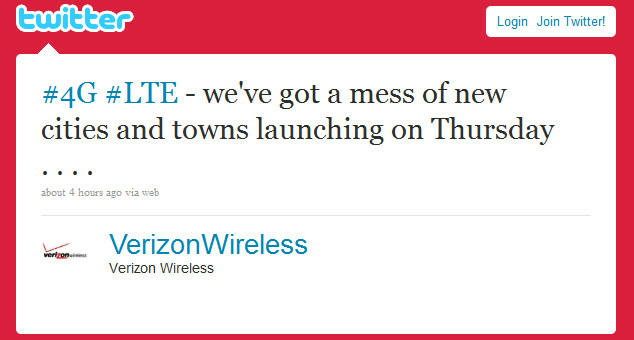 In the message, Verizon said that this Thursday it was going to add LTE coverage to a "mess" of cities and towns. In the tweet, Verizon didn't exactly pass along the names of the areas where you will find these 4G signals from the mobile operator, but the carrier has said that by the end of this year, LTE would be in 140 markets. The good news for Verizon is obvious-the more locations with 4G coverage, the more LTE enabled phones that will be sold. So far, the only LTE handset that is available from them is the HTC ThunderBolt with the Samsung Droid Charge expected to launch soon. If you have been hoping for Verizon's LTE coverage in your area, you might end up getting your wish granted before the end of this week. In Tompkins County? I haven't driven on Route 79 or 96 in a long, long time. Phonescoop had this story far earlier too. But its such a drab website. Keep up the good work, PA! hi well i have a thunderbolt 4g i live in los angeles. and i live by downtown La and i get awesome 4g signal outside and crazy fast internet speeds. but inside many high rise buildings i loose 4g reception and get 3G. i wanted to know if this is normal? because from what i read Lte was supposed to be better than 3G inside buildings. but with me is the opposite . so yea why is this happening? in 3g i can do everything i can do on 4g except video calls and at slower speeds. i dnt really get a 1x signal its usually a 3G icon but still what gives why am i loosing 4g inside buildings?? Phonearena covers the most news and is really organized. 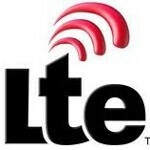 LTE was announced in Leheigh Valley, PA. The Allentown area of Pennsylvania and surrounding cities. Wilmington NC got it today!!! Love the speed and voice + data at the same time! !